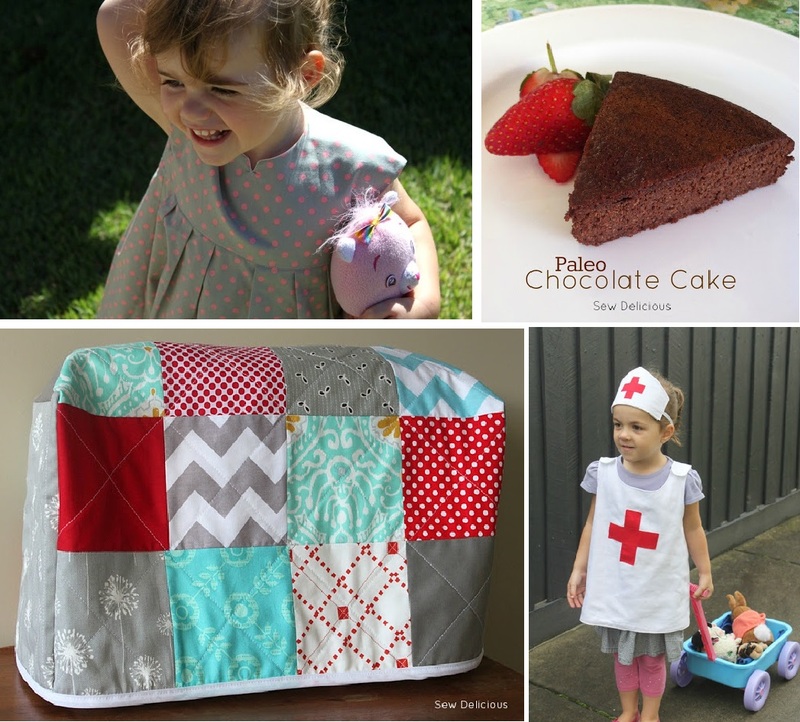 Hi everyone:) Today's guest for When we were young is my friend Ros from Sew Delicious. Ros is the only blogger I have actually met in the flesh and she is great! I had been reading Ros' blog for a while and she always left lovely comments on mine. I realised she lived in Melbourne too so I suggested we meet up for a play date earlier this year. My first 'online' date! We have since met up a few times and have a trip to the zoo planned for this Friday! It is so great to chat blog, fabric and sewing with someone who really 'gets it'!! Anyway, Ros has only been sewing for a few years and makes great stuff - clothes, pouches, bags and most recently, quilts. She is hosting a great swap (as she did last year) - the 'sweet pouch swap'. You can read all about it here. Ros is a great cook. Stefan and I can attest to the greatness of her flourless chocolate cake. Yum! Check out some of her other recipes here. She is also great at answering my bloggy questions, like, "What is this google groups thing? "(I still don't get this), and "do I need a facebook page?" So without further ado, I will hand it over to my fellow Aussie blogger friend - Ros!! I was born in Melbourne and lived there until I was 4. We moved to Brisbane for a couple of years, then Sydney, then back to Melbourne permanently in 1988, just before my 8th birthday. I'm the eldest of three kids, my sister Kirsten is two years younger, and my brother Andrew is five years younger. I always loved swimming, the beach and had a fascination for marine creatures, so I wanted to be a Marine Biologist. I was accepted into the Marine Biology course the university in Cairns (Far North Queensland) but I declined at the last minute, not wanting to move so far away. I sometimes wonder how different my life would be if I had chosen that path. I was pretty sporty, I was a state representative athlete, my main events were 100m, 200m and Triple Jump. I also loved playing netball.. Yes and no. I was a painfully shy kid in many ways - I always sat out when my siblings and cousins wanted to put on a show - I was too embarrassed! My kids are pretty outgoing which I'm glad about. Anna really loves reading books and I was a real bookworm so I think we will have that in common. Nope, I'm still in Melbourne, but we've had a few adventures along the way - I lived in Singapore and London in 2001 & 2002, and we lived in Canberra in 2005 & 2006. I live in the northern suburbs of Melbourne with my husband, two girls and miniature dachshund. It was tricky for me to find an outfit to recreate. Most of the photographs of my childhood are with my parents, who currently live in Queensland. I only have a small selection, but this one stood out to me for a couple of reasons. 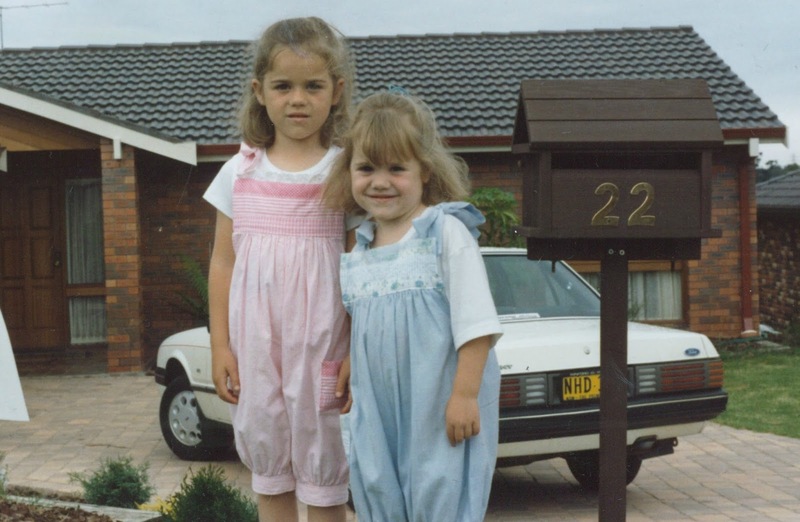 The whole picture - the overalls, the car and the house in the background -it doesn't get much more typical 80s suburban Aussie childhood than that! I think this picture was taken in 1986. Also, Mum often dressed my sister and I in matchy-matchy outfits, exactly the same garment but me in pink and Kirsten in yellow or blue. I was planning just to make an interpretation of the pink, and I think it must have been a popular style in the 80s because Cherie and Gail both made really similar style dresses for this series. As much as I love the overalls, I know that Anna would have been unlikely to wear them. She is all about the summer dresses - she wears them every day, even though we are in the middle of winter! I insist she wears leggings and long sleeved tees underneath so she doesn't freeze! 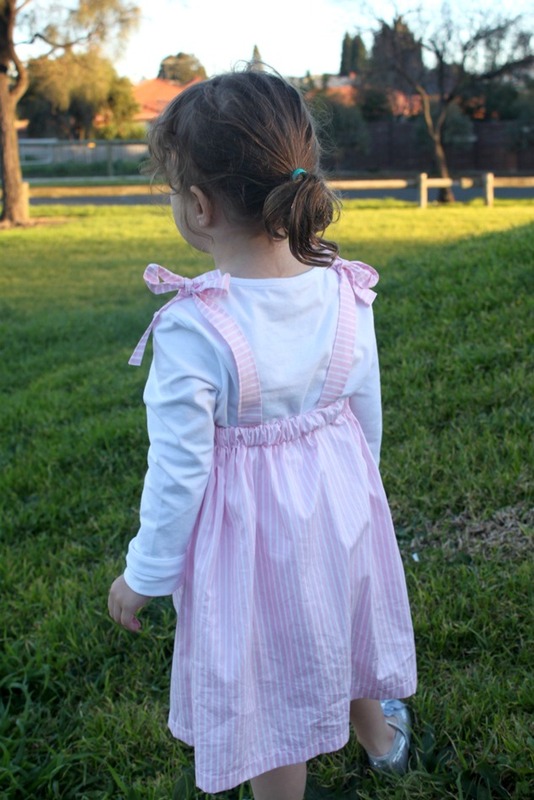 Once I made the pink dress I was keen to recreate Kirsten's blue outfit for Lucy so I could take some pictures of my girls together. This posed a problem though - she is not so great at cooperating during photographs at the moment. A last ditch effort just before dusk finally produced a few OK shots but GAH! It would have been easier to photograph the dog wearing a dress. For Lucy, I changed from blue to aqua fabrics, just because they were more available. I couldn't find many simple pale blues. 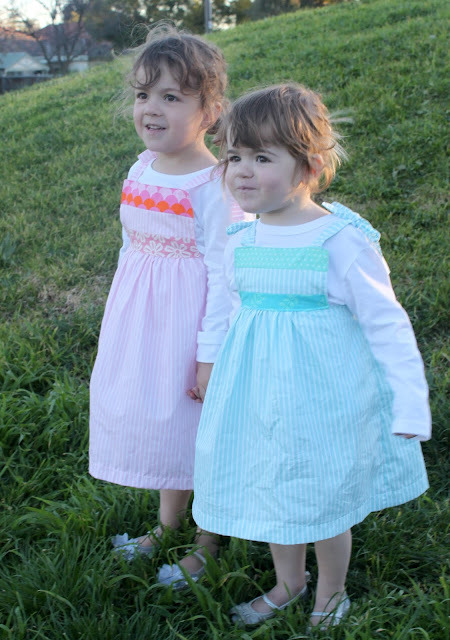 I made both dresses exactly the same way. Three scrappy strips sewn together to form a simple rectangular bodice. The front part of the skirt is gathered and the back is elasticated. I made simple straps and sewed them into the bodice and to the back skirt to form tie up straps. The back ties and elasticated waist makes this dress fairly flexible in terms of size - they will be great for summer later this year and hopefully next year too. So there you have it - some 80s inspired sundresses. Thanks so much Suz for having me, it has been such a lovely series! Happy sewing! Thank you Ros!! We all love the good old eighties!! Great interpretation! It worked out perfectly! Gorgeous, little dresses, Ros!!! Love the contrasting strips for the bodice. 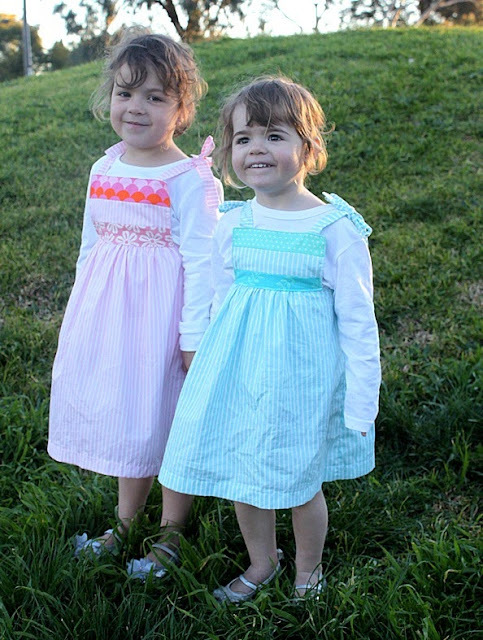 I wore very similar dresses as well - I always wore blue (or green) and my younger sister, pink (my mother loved to dress us in matchy outfits). Thanks everyone for your lovely comments :) The girls were pretty cute together in their dresses. For my parents I think they see history repeating! Gorgeous and great job Ros - totally cute! went for a flight at LAX in Los Angeles, California on April 24.